Anatomy of the digestive system; drawing shows the esophagus, stomach, liver, pancreas, small intestine, and large intestine (colon). Anatomy of the digestive system. The digestive system is made up of organs that are important for digesting food and liquids. 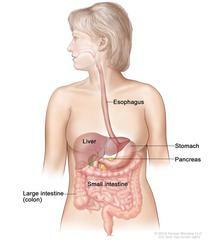 These include the esophagus, stomach, liver, pancreas, small intestine, and large intestine (colon).